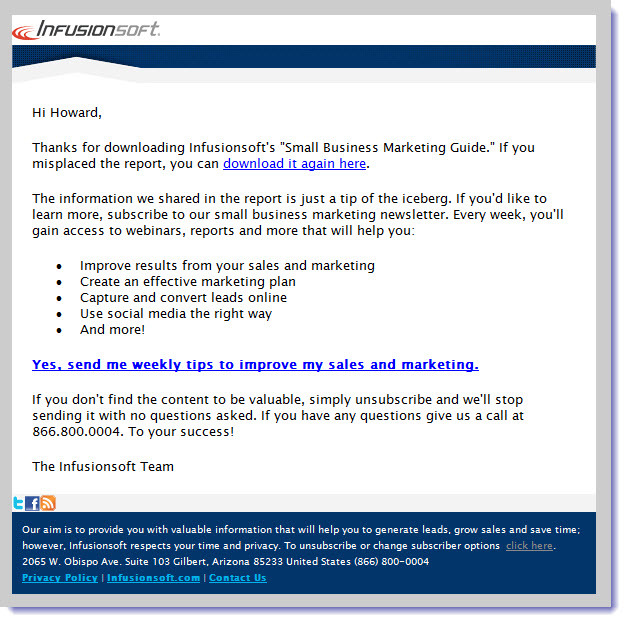 There’s a lot to like about the email campaign I received (image below) recently from Infusionsoft, a maker of sales and marketing automation software for small businesses. It’s not perfect by any stretch (the copy could use some improvement – more on that later) but many of the techniques on display are simple, straightforward best practices you can easily apply to your next lead generation campaign. 2. Make the reader feel confident he or she is going to learn something specific. The more specific and tangible the benefits of reading the information, the more likely people are to want it. 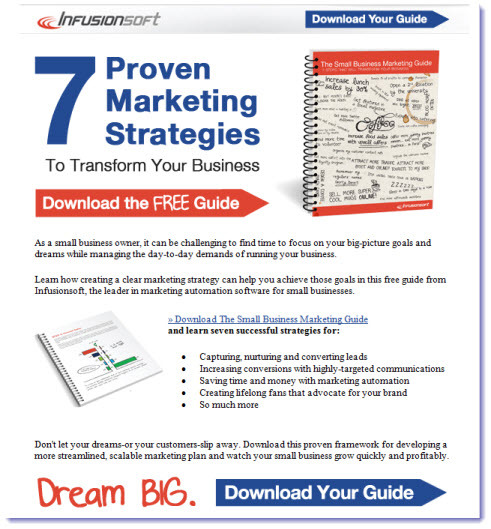 Here, “7 Proven Strategies to Transform Your Business” is clear, concise, and promises immediate value. 3. Repeat the call to action. In a very short space, the call to action (download the guide) is repeated 4 times – 3 times as graphic icons (the subtle arrow connotes action: a nice touch) and once as a text link within the body copy. Yet, at no time do any of the calls to action seem redundant. 5. 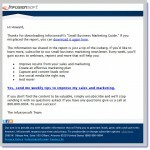 Make lead nurturing part of your campaign plan. These days, it’s not enough to generate leads and then just throw them into some generic, one-size-fits all, lead follow-up process. 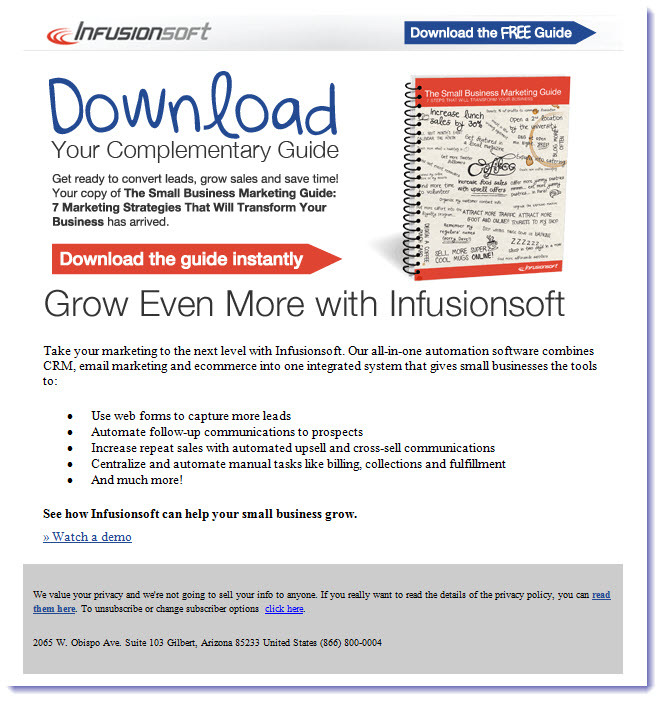 Lead nurturing will always be more effective when it’s targeted, personalized, and relevant. 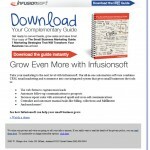 In this case, the first follow-up email I received upon downloading the guide (see thumbnail at right) reinforces my decision to respond, provides an additional link to the content in case I misplace it, and offers up a “next step” (and the promise of more tips on how to improve my business) in the form of the Infusionsoft newsletter. Still, when so many email campaigns include landing pages, offers, fulfillment, and nurturing emails that were clearly afterthoughts, this is a great example of a cohesive, integrated campaign, planned and designed from start to finish. This entry was posted in B2B Marketing, Content marketing, email design, email marketing, Graphic Design, Interactive Design, Landing Pages, Lead Nurturing, Marketing Automation and tagged b2b demand generation, B2B Marketing, email design, email marketing, Infusionsoft, Lead Nurturing on January 13, 2012 by Howard Sewell.